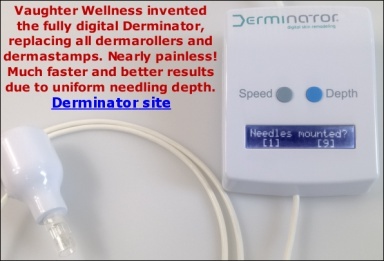 I'm new to the world of dermarolling and just had some questions about where I should start. So for starters Ive had acne since my teenage years but began to clear up as I got older. Just 3 years ago I suffered a terrible breakout and ended up having to go to the dermatologist. Although it has since cleared, I have been left with acne scars. Theyre not too bad but they are still noticeable and at times effect my self esteem. I would love to go back to having smooth skin. I am currently using a gentle cleanser 2x daily and retin-a, along with a cleansing brush at night. I was wondering how I would be able to incorporate dermarolling into my routine. I was also wanting to know which needle length would be best for my scars. Ive included some pictures so you can get a better idea of whats going on. Re: Not sure where to start?? First of all, it was like looking in the mirror once I seen your pics. Our scars are very similiar. Not severe but noticible and makeup won't help because all it does it seep into the indentations This was the main reason I set out to find something that would help improve my complexion. Have you gotten a chance to read through Sarah's pdf instructions? Lots of good info there and would be a great place to start with educating yourself about needling. Sarah will give you her recommendations and that will get you pointed in the right direction but also read through the other posts and search the net on nutrition and wound healing. I'm taking additional supplelments like a multi, vitamin c, vit e, zinc, and recently added MSM to my treatment and even though I'm fairly early with my own needling sessions I'm already seeing improvement in my scars. I will answer the OP a bit later. N I do agree, makeup doesn't really help. It does to a certain extent but in certain types of light. I am currently taking a multivitamin. I used to take msm but slacked off on taking it. I need to get some more so I can start taking it again. The same for vitamin e.
I have read the instructions, as well as, alot of the posts. There is ALOT of great info on needling and the products to use. The site is very informative, especially when reading others' experiences. How long have you been needling? You are most welcome and of course I'm willing to offer support, tips, and any new or interesting info I come across to help on this journey we are both on. The encouragement alone just puts you in a positive frame of mind I actually tried needling in 2011 but I wasn't being consistent enough to get any real results. My diet was horrible so I wasn't taking care of myself and I was still breaking out occasionally. And to top it off I was smoking which is a big no no! January 2013 I vowed that this was going to be the year I started taking better care of myself because my complexion really really got me down. I finally quit smoking in February, started my supplements, and began needling seriously the first weekend in May 2013. I'm documenting my progress on this site as well so check out my pictures when you have time. Also, feel free to email me and I can send you some links that I came across that you may be interested in and some details of what I'm doing just in case you would like to know. I've gotten all of my needling tools from Owndoc but my supplements I've purchased from other vendors. For the time being, I suggest you use just a 1.5 mm dermastamp (not a dermaroller) and stamp your scars densely every three weeks. Stamp scars on one cheek, when it heals, stamp the other cheek. Please write me after about six months and tell me whether the scars are improving and whether you get hyperpigmentation after stamping and if yes, how long it lasts. Then we may add more dermaneedling instruments to your skin care. You have a very even skin tone and apart for a few scars, your skin looks nice. I appreciate the reply Sarah! So with the 1.5, Im sure ill need a topical numbing cream rite? Also, as far as alternating cheeks, do you mean the first week do the left and after the next 3 do the right? Or do you mean do each within a couple days? Also with incorporating needling into my current routine, do I skip the cleansing brush on the day I needle? And also how soon wld I be able to go back to using it? I can definitely see why your so passionate about needling. Feel free to email me as well :0) Im going to try to stay consistent. I know consistency equals results. Congratulations on quitting smoking!! That alone is a big accomplishment! It depends how sensitive you are to pain. Many of our customers stamp or roll without a numbing cream. Stamping is less painful than rolling. I meant within a couple of days. As soon as the first cheek looks healed, stamp the other. Write down what date you stamped which cheek so that you know when to stamp next. Each cheek should be done approximately every three weeks. You can brush on the day that you needle but do not brush until the needled skin looks healed. Never brush or exfoliate if you have scabs. Scabs must fall off naturally when they are "ready". The forcible removal of scabs can leave scars. Ok sounds good. Thankyou for the feedback! I will definitely get started ASAP!